I have a great mother who is involved in my life. I have been married to the same wonderful woman since Feb. 1, 1997 and she is the mother of both of my daughters. Mother’s Day is a joyous, easy fit holiday for our family. Sometimes life is not made for holidays. Hallmark has yet to create a card that explains every situation. Under certain circumstances, the perceptions of Mother’s Day may range from an annual reminder of loss to an empty celebration of a relationship someone never had. Yet, in our perfection and dysfunction, we all sit together in church. In comes Mother’s Day, once a year, with a glossary of stereotypes, categorical assumptions, and ignorance of the caveats of life that may make celebrating motherhood at bit uneasy. What do we do when Mother’s Day hurts? How do we avoid, amongst the people of God, emotional separation in a day of celebration? 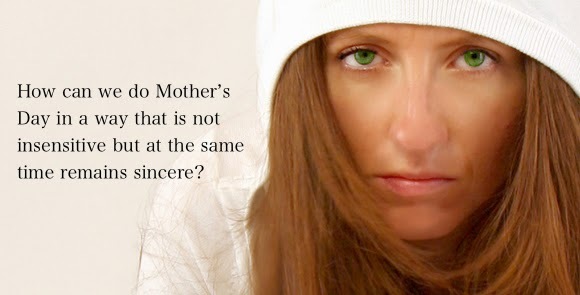 How can we do Mother’s Day in a way that is not insensitive but at the same time remains sincere? We live in a highly sensitive culture that makes an impossible demand – get it right for everybody. Fortunately the church is a community of grace that embraces us when we don’t get it right at all. Romans 14 teaches the church how to handle our days with grace. Some people will find a holiday hard to live without. Some will find a holiday hard to live with. It is required of both parties to use a measure of grace to realize what a holiday is and what it isn’t. Paul warns us not to esteem any day as so important that we lose sight of Christ. Mother’s Day doesn’t make a mother, but mothers make the day. A mom with children should not be made to feel guilty for her family on Mother’s Day. At the same time the day should not be used to deflate or devalue those who are not. Yet grace gives us a loving way to handle our days that creates a bond between us despite the variables in our community of circumstances. Mother’s Day is an opportune time to share incredible stories of how God’s love has created familial relationships, helped in times of loss, or provided sustaining strength in a world not ready made for Hallmark. In a culture that questions the value of birth and by its innuendoes communicates that parenting is a hassle; grace creates a place where the stories of women who want, love, lose, adopt, have big families or struggle to have any family are shared. In grace each find a place. Some of my favorite moments of Mother’s Day, through the lens of a pastor, are not in the conversations we avoid, but they come while listening to the conversations grace demands. Grace creates a place where the mother who lost an unborn child receives strength, love, and counsel from the matriarch of many. At the table of grace sits an adoptive mother who shows a new mom how to handle her colicky baby. Grace makes Mother’s Day beautiful. Grace liberates us from an environment of legalism in which sensitivity is the law and celebrates the story of motherhood in an imperfect world. Every day needs grace. Celebrate the story of the gospel. Following the curse, Adam inaugurated the first celebration of moms. In Genesis 3:15 God informed the serpent that a child would be born of the woman who would crush the tyranny of Satan and liberate us from the curse of sin. While we do live in a world that struggles with infertility and infant death, we cannot deny that every person that exists can celebrate God’s goodness in preserving the blessing of God to be fruitful and multiply. We have been born. In Mother’s Day we should also be reminded that the Son of God has been born of woman (Galatians 4:4). It is through His virgin birth, atoning death, and victorious resurrection that we find new birth. What we will deal with in this life, until the return of Christ, will always be an imperfect version Mother’s Day. There will always be loss and caveats to our sin cursed stories that will bring pain into the holiday. We are all vulnerable. Therefore, Mother’s Day should not simply be a recognition of mother’s but a proclamation of the hope we have in Christ. Mother’s Day should remind us of the gospel story. It is a story that tells us, yes, you have been born, but we must be born again. It is also a story that reminds us that in whatever situation we find ourselves on Mother’s Day, there is a meta-narrative that comforts us all, reminding us that in Christ all things will be made new. His grace is sufficient. He has not left us hopeless. Mother’s Day should carry with it the proclamation that for every broken hearted woman, no matter the circumstance, that we have a Savior who has stepped into our story. The gospel gives us hope in the loss of every unborn child. The gospel speaks into the grief of every mother who has ever said goodbye to a child of any age. The power of Jesus being the firstborn from the dead brings the potential of fertility where there is none. When Adam heard the gospel it compelled him to look at his wife in a whole new way. She was not yet a mother in one sense – in another sense, she already was and would always be a mother. However, one chapter later she would lose a child. Even after Cain killed his brother Abel, the gospel preserved the meaning of Eve. Because of the birth of Christ, she would always retain the title Mother of all Living. Through Christ, there is a dignity every woman shares with Eve. The gospel is that powerful. I am sure in the centuries of life God gave them on the planet, that Adam and Eve experienced every conceivable heartbreaking story that threatens to crash a Happy Mother’s Day. Yet Adam and Eve heard the gospel in the promise of the Savior’s birth and it gave them hope as they walked away from the garden as exiles into a less than perfect world. Because of the gospel none of us are exiles on Mother’s Day. and the author of #TheWalk. Posted in Grace, Holidays, Mother's Day.